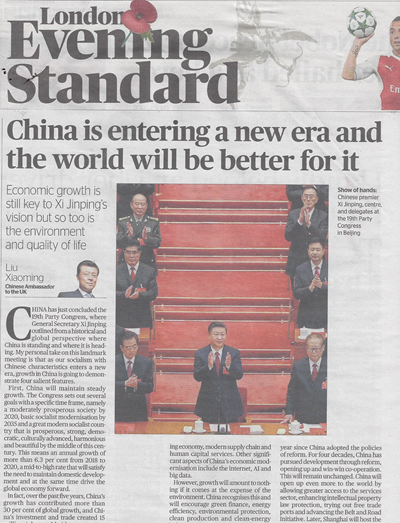 The Evening Standard Publishes a Signed Article by Ambassador Liu Xiaoming Entitled "China is entering a new era and the world will be better for it"
China has just concluded the 19th Party Congress, where General Secretary Xi Jinping outlined from a historical and global perspective where China is standing and where it is heading. My personal take on this landmark meeting is that as our socialism with Chinese characteristics enters a new era, growth in China is going to demonstrate four salient features. 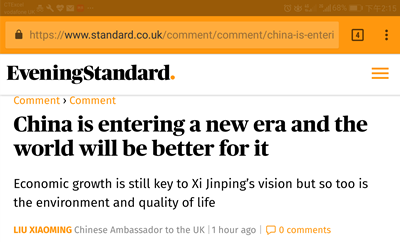 First, China will maintain steady growth. The Congress sets out several goals with a specific time frame, namely a moderately prosperous society by 2020, basic socialist modernisation by 2035 and a great modern socialist country that is prosperous, strong, democratic, culturally advanced, harmonious and beautiful by the middle of this century. This means an annual growth of more than 6.3 per cent from 2018 to 2020, a mid-to-high rate that will satisfy the need to maintain domestic development and at the same time drive the global economy forward. In fact, over the past five years, China's growth has contributed more than 30 per cent of global growth, and China's investment and trade created 15 million jobs worldwide every year, including 180,000 jobs in the countries along the Silk Road Economic Belt and the Maritime Silk Road routes. Meanwhile, China is clearly aware of the potential systemic financial risks and is taking counter-measures to guard against them. We are strengthening financial monitoring, curbing the increase in local debt and de-leveraging state-owned enterprises. We are improving state-owned asset management to prevent state asset drainage. We are introducing a negative-list approach with regard to market access to encourage fair competition and thwart monopoly. A China that maintains steady growth will contribute to the prosperity and stability of the world. Second, China will focus on the quality of its growth. High-speed growth is now giving way to high-quality growth, and China will seize this moment to press ahead with supply-side reform, advance industrial transition, speed up structural upgrading and facilitate innovative development in order to build a modern economic system. With a booming advanced manufacturing sector and with the industries moving up the value chain, China will find new ways to boost growth, through high-end consumption, innovation, green and low-carbon technology, sharing economy, modern supply chain and human capital services. Other significant aspects of China's economic modernisation include the internet, AI and big data. However, growth will amount to nothing if it comes at the expense of the environment. China recognises this and will encourage green finance, energy efficiency, environmental protection, clean production and clean-energy industries. We will establish agencies to manage state-owned natural-resource assets and monitor ecosystems. We will strengthen environmental control on water, air and land pollution and bring polluters to account. High-quality growth in a major country with a population of 1.3 billion will be key for sustainable development in the world. Third, China advocates inclusive growth. Our main task now is to address unbalanced, inadequate development in order to meet its people's need for a better life as well as for greater democracy, the rule of law, justice, security and a better environment. China believes in putting people first and wants well-rounded development for every individual and social progress in all respects. The Chinese dream means equal opportunities - and that means no one is left behind. Inclusive growth is now our overriding task. Every citizen must be able to get a sense of personal fulfilment, happiness and security from the nation's development. To ensure that, China will make its pension system and medical insurance system more extensive and inclusive, covering both urban and rural residents. We will provide more affordable housing and increase investment in higher education and vocational schools. A China committed to inclusive growth will provide the world with a huge market of enormous potential. Lastly, China's growth will be win-win for the world. It will be 40 years next year since China adopted the policies of reform. For four decades, China has pursued development through reform, opening up and win-win co-operation. This will remain unchanged. China will open up even more to the world by allowing greater access to the services sector, enhancing intellectual property law protection, trying out free trade ports and advancing the Belt and Road Initiative. Later, Shanghai will host the first International Import Expo. Looking ahead, China hopes to play an even more important role in global economic governance, economic globalisation, trade liberalisation and common development. And as we do so, we seek co-operation not confrontation with other nations; we want win-win outcomes, not zero-sum games. We will not take the old trajectory where "power leads to hegemony" but blaze a new trail of win-win co-operation where everyone has a stake in decision-making and a share of the benefit. History is the best teacher. During the most difficult times in 1940, Winston Churchill said: "It is victory. Victory at all costs - victory in spite of all terrors - victory, however long and hard the road may be ... that mankind shall move forward toward his goal." Seventy-seven years on, in response to the challenges facing the world, President Xi Jinping said: "We should not give up on our dreams just because the reality around us is too complicated; we should not stop pursuing our ideals just because they seem out of our reach. We call on the people of all countries to work together to build a community of shared future for mankind." At the 19th Congress, China shared its story and its wisdom, and contributed its solutions. This is how the Congress will be remembered.